Be the first to hear about their new releases and deals. Download the Booksprout app and search for Beth Aldrich today! 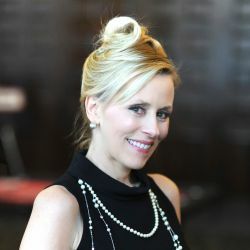 Beth Aldrich is the award-winning, bestselling author of the nonfiction book, Real Moms Love to Eat and author of the debut women's suspense thriller, Pink Slips. She's a former PBS-TV Series and radio show host with a background in creative writing and on-camera media. Beth lives in Chicago's north shore with her husband, three sons, and two Tibetan Terriers, Karma and Bonsai. She loves bacon, buttered popcorn, and Phish Food Ben and Jerry's ice cream.